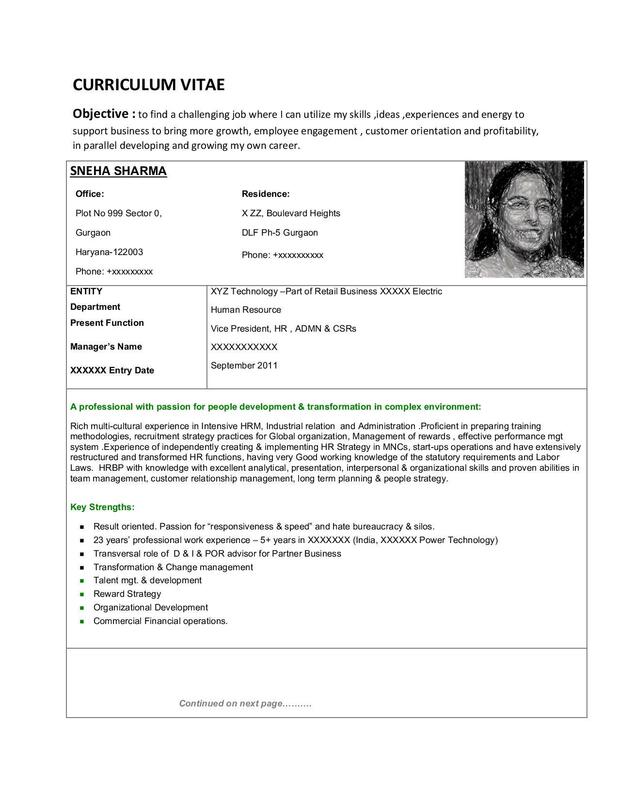 A look at how we transformed the resume of an HR Vice President into a Top Leadership profile. The client is a Senior Human Resources Professional having an accomplished career in handling Organizational Development, Human Resource Management and Operational Leadership. We quickly had a look at her resume and realized it already resembled our questionnaire where the original seven pages provided in-depth chronological information of how she spent her time over the past 23 years. The Presentation and format of the resume was not consistent and this led to the original length being 7 pages. In this age, recruiters do not have the time to go through 7 pages, instead they have few seconds to screen the resume and identify best fit candidate for the next process. Hence, a one or two page usually suffices the purpose. As is the case with most of the resumes, Objective written had a very generic statement, something that can be seen in every second resume. Neither the target role was talked about nor the industry where the client intended to work, highlighted. For seasoned professionals, the objective should be framed in such a manner that it leaves a long-lasting impression on the recruiter. Personal Details were mentioned in the beginning and included a lot of information which usually is not required. Also, the use of table could hinder her chances of getting shortlisted as, nowadays; recruiters use ATS to screen the initial job applications. Too much information inside the tables often does not get recognized or it gets identified in an ambiguous manner, which a lot of times leave the recruiters confused, leading to rejection of your application. In this age where people do not have enough time to read resumes, information needs to be presented in a way that swiftly makes an impact and catches reader’s attention as quickly as possible. Also, we noticed some of the bullets written in the original resume were well crafted/drafted but at the same time roles and responsibilities could be written in a much better way to the role targeted. The flow from one work responsibility to another was missing and a lot of work could easily be combined or stitched together to create a more powerful and impacting bullet. Quantification: The resume being a marketing tool; we observed that the client did not quantify the information provided in the resume, which is an absolute necessity to substantiate achievements. It also serves another important factor i.e., quantified resume puts the candidate in a better position in comparison to the other candidates and can help to negotiate a better pay package. Here again, the resume consisted of a lot of unnecessary details (here, these are a bunch of bullets filled with self-praising adjectives and activities: Enjoy traveling, Playing games, Plays Badminton represented state in national competition, Listening music, cooking……) which can easily divert the mind of the recruiter. 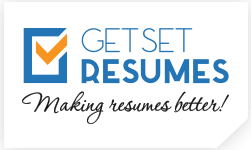 In case of hiring senior professionals, recruiters are best looking for a resume that meets their requirement. All that is required of such a senior person is to have relevant information in the resume. Also sections such as Education & training could be presented in a much cleaner & easy to read manner. Some other issues that we noticed will be addressed while providing the solutions. Now we already had a resume which was filled with all kind of information, so we decided to skip the IE form and instead scheduled a one-one call with the client to understand her point-of-view, focus area or industry, targeted role, future plans and initials expectations of the client from the first draft. We found her a bit confused regarding how she should portray her vast experience and therefore guided her to select the best information and avoid the ‘not-so-relevant’ information. Also, the challenge ahead for us was to extract the necessary quantifiable information from the client to back her work experience. 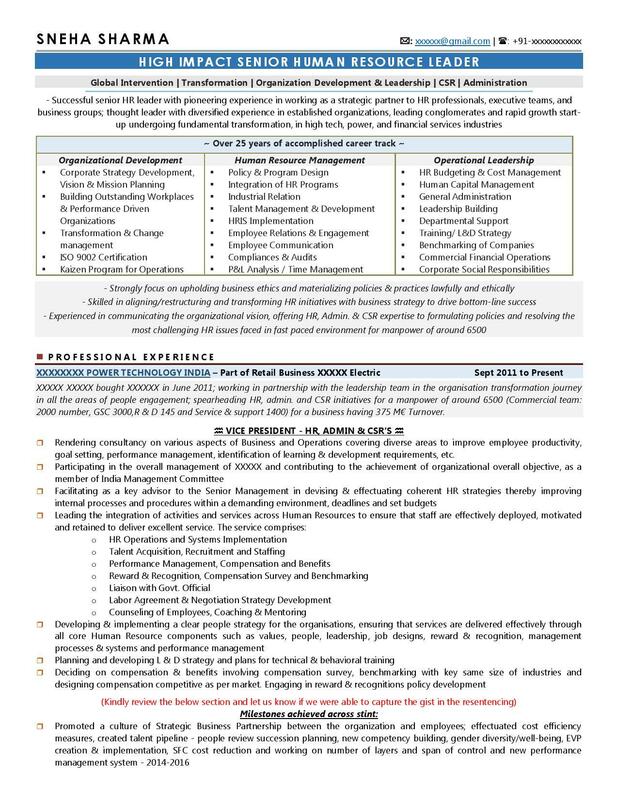 We recognized her need of a resume that ultra-focused on her HR abilities with focus on management of relatively complex and large HR initiatives. Following our process we first ensured that unnecessary sections and information were omitted from the resume. Now, we only had the most relevant and crucial information at hand. Post removing the unnecessary information, we added a box at the top which provided the personal details, targeted role and a single powerful sentence that effectively communicated what the client had been doing over the years. Next, we tried to build a positive personality of the client for the recruiters & professionals by giving a brief overview of the various skills obtained and management & execution abilities showcased in the next two paragraphs. The skills part wasn’t stressed upon at all by the client in her initial resume. This was necessary since a lot of recruiters use advanced technology/ applications to arrive at the decision of whether the candidate is a right fit or not – for which having the right amount/quantity/number and properly written technical skills is necessary. Post this, the career Abstract section provided a befitting end to our initial purpose of creating a positive frame of mind about the client. Key bullets showcasing her extensive experience in HR leadership further pushed her case for job consideration. Coming to the most important section of the resume i.e., ‘work experience’, the initial resume provided to us consisted of description which was inconsistent and content wise, at time consisted of both strong & weak bullets. The client agreed to our suggestion of presenting the most recent work experience in a detailed manner while prior experience were explained in a brief manner (the purpose & weight that individual experience carried was not lost while representing it in a concise way). This greatly helped in limiting the resume document to 2 pages. Experiences prior to 2005, stressed on the individual HR role performed followed by a short description answering the What, When and How of the job. The scope properly defined the huge responsibility entrusted by the organization on the client. The last section talked about Academics, Professional courses & trainings pursued by the client in the last 20+ years. The initial information & resume furnished was now completely transformed into the document which focused specifically on the results delivered by the client. The original resume presented her as mid-level HR professional but through proper collaboration & communication we effectively delivered a resume that swiftly conveyed her vast HR experience and enabled her to successfully compete for senior-level HR positions. Very happy with the outcome and extremely impressed with how accommodating these guys were with all the alterations mentioned and took the suggestions seriously.